Dr. Paley will begin treatment with extensive soft tissue releases. This will include a subtotal fasciectomy including excision of the fascia lata (which is particularly tight in patients with PPS). After excision of the fascia, Dr. Paley will then resect the hamstrings and gastrocnemius muscles, or perform a z-lengthening of these structures. 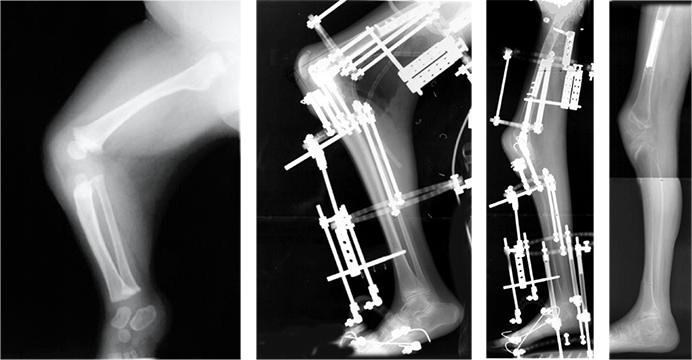 Dr. Paley used to treat PPS with gradual distraction of the joint using external fixation. However, this method often resulted in soft tissue “rebound” in which patients gradually lose their increased range of motion after distraction. Furthermore, gradual distraction immobilizes the joint for too long. Dr. Paley sought to develop a new, better strategy for treatment of PPS: bone shortening. Instead of distracting the knee joint, Dr. Paley will shorten the femur. Shortening the femur “relaxes” the contracture by shortening the distance these structures will cover. While this treatment strategy is relatively new, Dr. Paley has achieved excellent results with this approach. After treatment, patients demonstrate dramatically improved gait and function.